The diversity in these stories is impressive, from girls facing internal and external religious challenges, to girls pretending to be something they’re not to make their way in a man’s world. These are tales of young women refusing to be a product of their time, yearning to be free of society’s mores. The authors refrain from a black and white picture, with a young Mormon girl questioning her religion, yet continuing to fight her community’s detractors. Secrets abound, as an orphaned girl lives life as a boy to take care of herself, and a young boy trades his secret of being a transgender with a Hispanic girl putting in tremendous effort to pass as white for Hollywood. 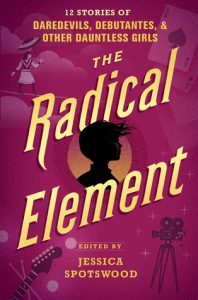 One story had magical elements that didn’t seem to contribute to the plot, but as a whole, this book offers up a dozen girls as unintentional heroines who fought against patriarchy, misogyny, and other obstacles they intended to overcome. I was fortunate to receive a digital copy of this wonderful book through NetGalley.